Whoever yesterday morning arrived along the Múzeum street to the Little Boulevard, had a special experience. 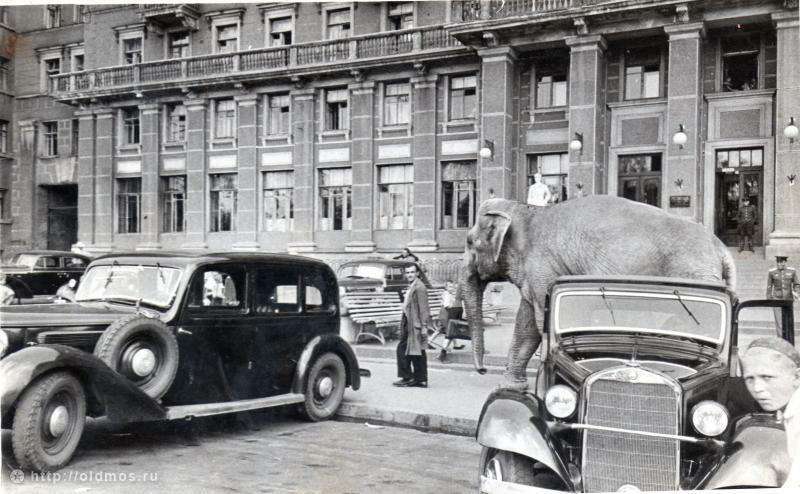 Due to the unbearable tension in style and quality between the 19th-century neoclassical building of the National Museum and the recent glass-and-steel mammoth of the nearby Calvin Center, the space-time continuum was ruptured, and the vortex threw to the surface an Indian elephant in full dress, complete with a throne and a maharaja. 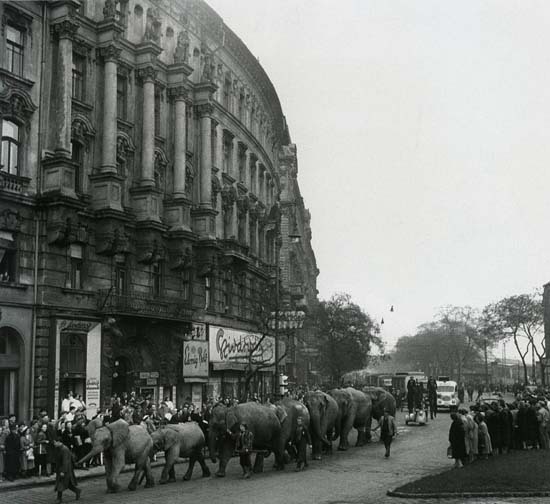 Such phenomenon is absolutely common in Budapest, whose streets since time immemorial are unexpectedly flooded by elephants which then just as suddenly disappear in the nothing. A proof is this photo by Endre Friedmann from 1958 showing a whole herd of elephants marching along the Theresa (at that time Lenin) Boulevard towards the Andrássy (at that time People’s Republic, some months earlier Hungarian Youth and even earlier Stalin) Boulevard: maybe it was the accelerated rhythm of name changes to cause such space-time fluctuation. 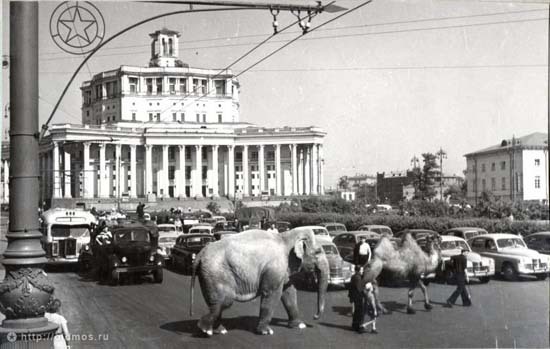 That the unexpected appearance of elephants on the streets of big cities is a concomitant of great political earthquakes is proved with many examples by twentieth-century Russian history. 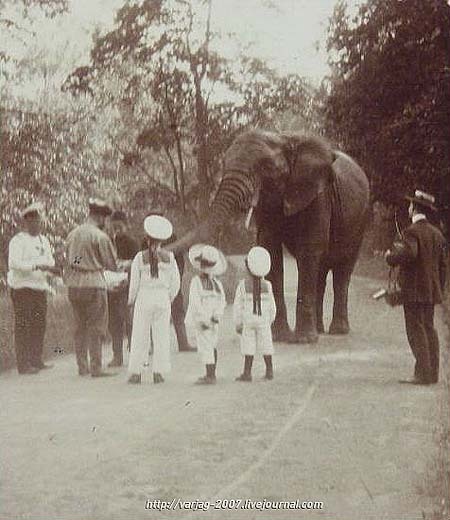 Beginning with the elephant, which appeared in 1916 at the imperial residence of Saint Petersburg’s Tsarskoe Selo and disappeared within a short time together with Nicholas II and his family feeding it on this picture. But on this we will write another time: the elephants of St. Petersburg have their own secret history. And ending with the one that appeared in Chernobyl at the end of the 1980s. 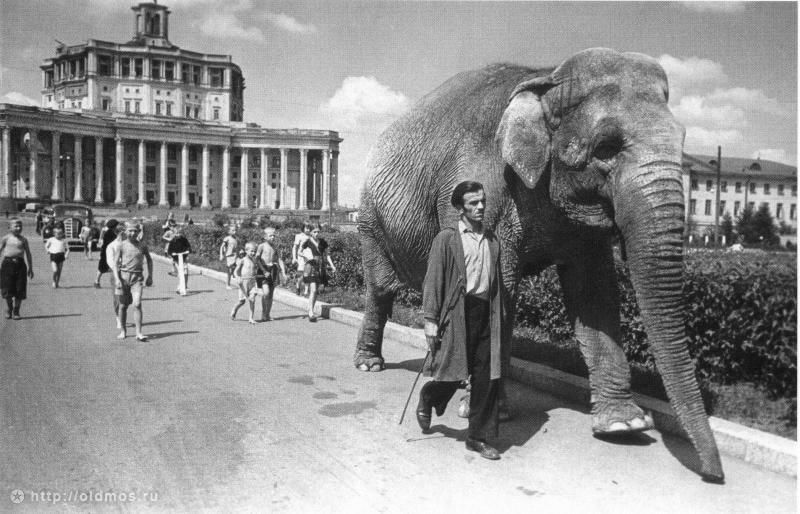 In this case, however, it was the socialist reality that proved more virtual: the Soviet Union disappeared and the elephant was left. Thus it is just natural that the third, most shocking event of 20th-century Russian history, the Great Patriotic War was also accompanied by the emergence of an elephant, which, similarly to the war, came from Germany. 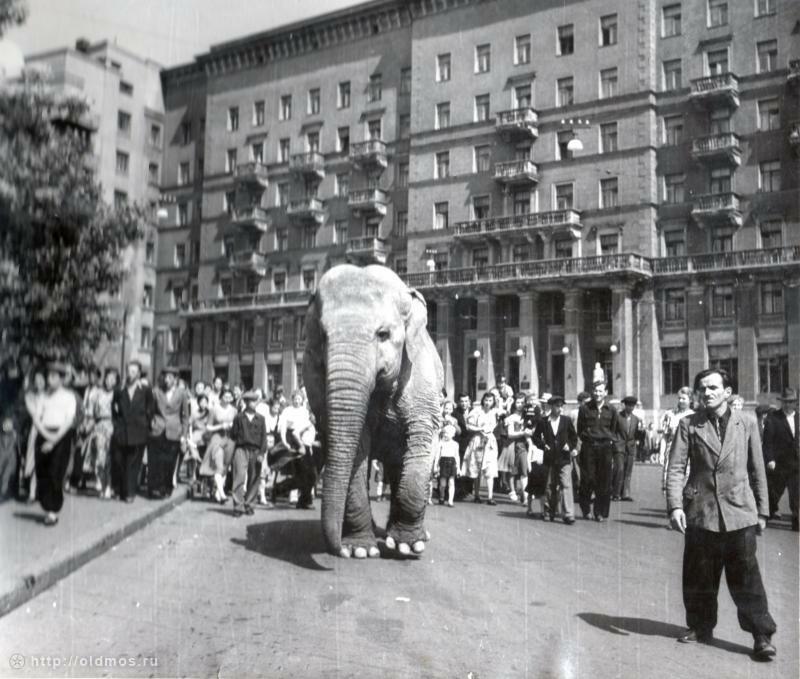 The elephant named Punch arrived together with the circus captured in Berlin as a trophy by Marshal Zhukov. In Moscow it was accommodated in the famous Ugolok Durova Animal Theatre founded in 1912 by animal trainer and clown Vladimir Durov. 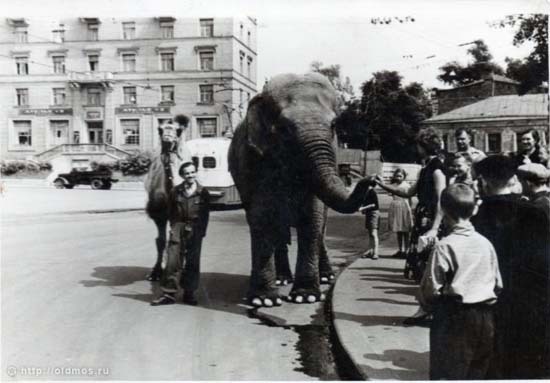 Its caretaker, Karl Stvora, who also came as part of the trophy, led it to a walk every day to the nearby Suvorov Square, either alone or with the camel of the circus, to the great pleasure of the people of Moscow. 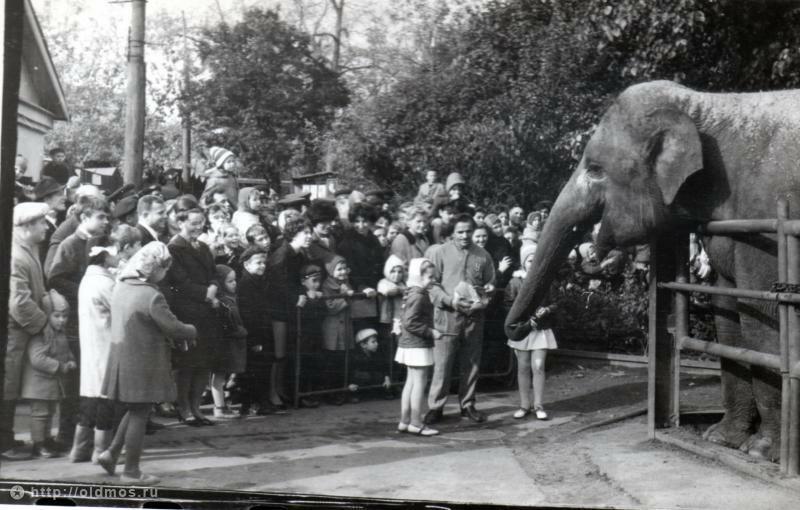 so the crowd flocked after it. 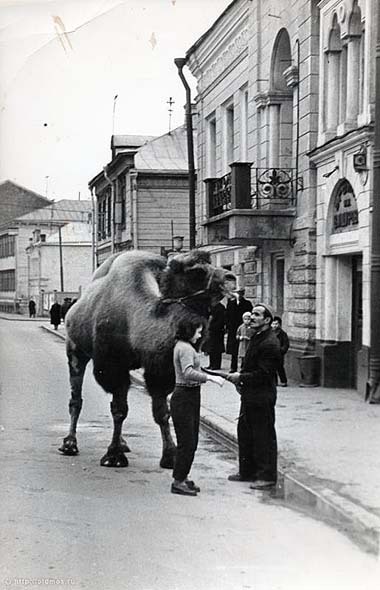 showing that he would fight with it. can put to flight so big bullies! 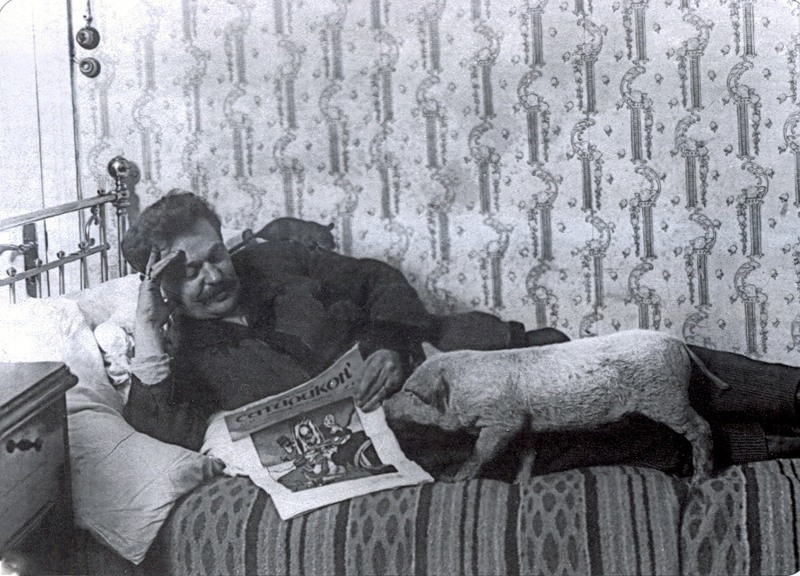 “Well, the pug! he’s a real macho! The news in the elevator (!) had a picture of that elephant, named Szandra, with a caption indicating that it was loose in the streets for a while. Oddly, it's not yet in Google News in the languages I normally read, but here's Blikk. 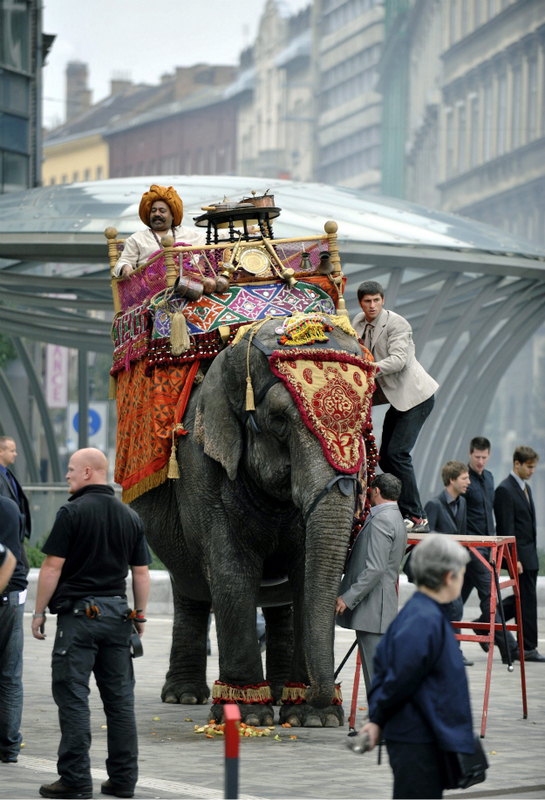 Yes, many Hungarian newspapers reported on it yesterday with the caption “a Spanish ad spot is being shot on the Little Boulevard”, but this is just a miserable rationalization, which fails to account for the other elephants. The most probable explanation is the rupture in the space-time continuum. 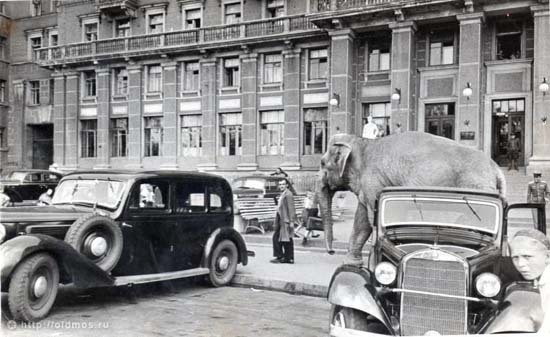 I think that crocodiles and elephants and other wild animals use to live among us, quietly walking down our streets and sharing with us our cities: we just don't pay enough attention. What a great story Dedushkin told! I like it so much, thanks to Studiolum for reporting it. 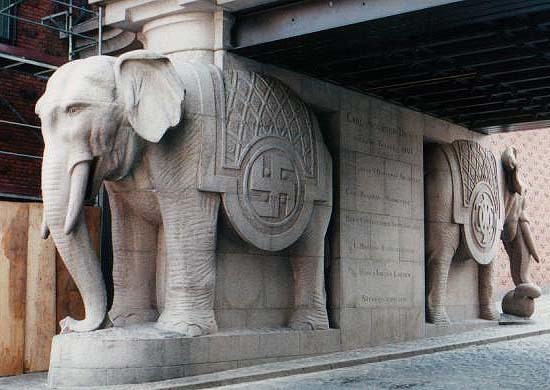 I wonder which is the end of the story of the German and his elephant. For the strangest beings living with us in our cities, read Michal Ajvaz’s exciting “The other city” about “the hidden Prague”! 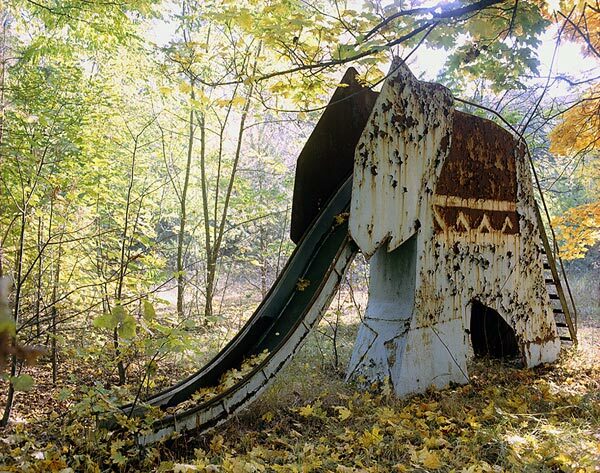 As to “the German”, his fate slowly turned better. Apparently he married in the 60’s (for several reasons we think that the above report, despite the “fifteen years” mentioned in it, refers to a period only five-six years after the war) and he had two sons. 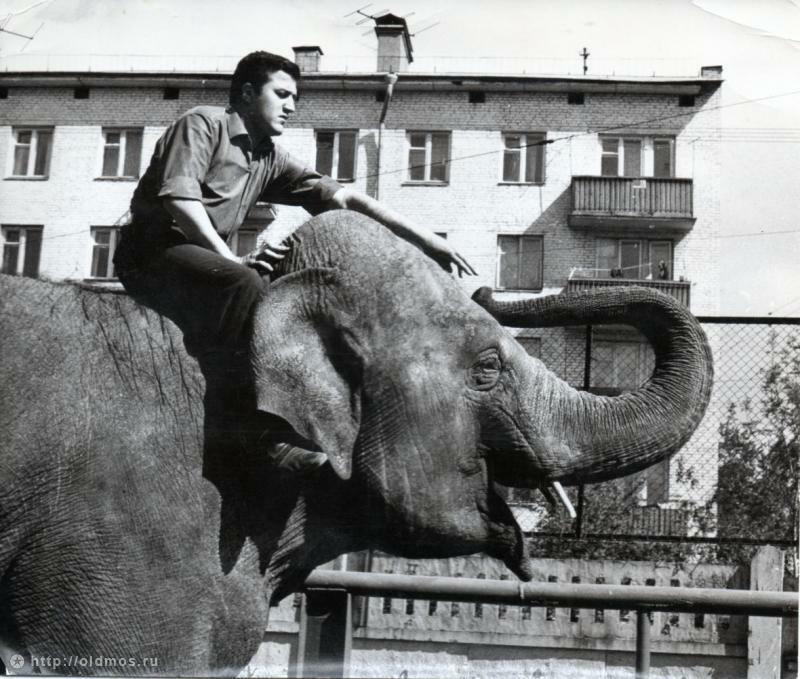 One of them, Pavel lives in St. Petersburg, and he’s an animal trainer as well (here you can see him on his father’s elephant). Punch died in the 60s, but then Karl received another elephant, Jenny. 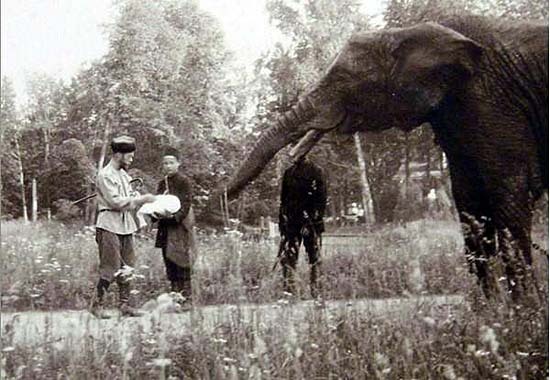 He died in 1991, shortly outliving the Soviet Union which he served with his elephants. 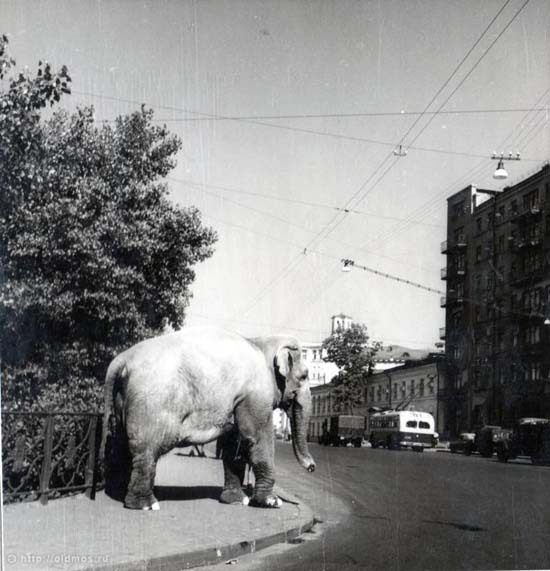 The history of Piter’s elephants is a complicated and amusing one, marching through several dimensions of reality and unreality. We will try to resume it in a next post. Thank you very much, Studiolum. 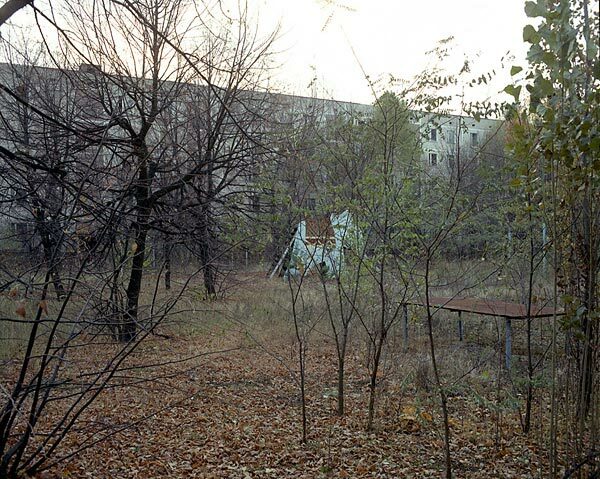 Rio Wang is like a house with many rooms: you can come in, leave, come back, and there is always someone telling a new story. What, no mention of родина слонов? Ssh! 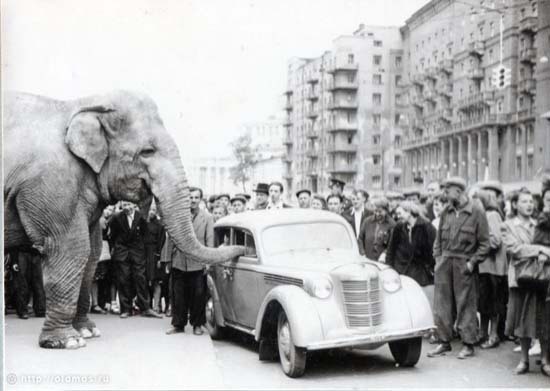 I reserved this point for the post written on the elephants of Petersburg and their role played in the revolution!